Properties in Shawnee Bend average 4.8 out of 5 stars. Lake front condo with new appliances, furniture, mattresses. 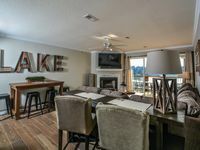 Property 8: Lake front condo with new appliances, furniture, mattresses. Free night! Walk In Level. Remodeled. Afternoon Shade. Big View!! Property 10: Free night! Walk In Level. Remodeled. Afternoon Shade. Big View!! Ledges Most Desired Point Walk-In 3 Bed 2 Bath Overlooks Pool Main Channel View! Property 16: Ledges Most Desired Point Walk-In 3 Bed 2 Bath Overlooks Pool Main Channel View! Free night! Main Channel Waterfront Condo. Beautiful View! Property 21: Free night! Main Channel Waterfront Condo. Beautiful View! 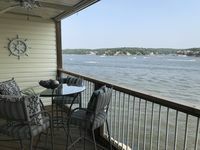 Property 23: Lake front walk-in condo, large deck with evening shade and awesome water view. Gorgeous Getaway in a Spacious Lake Retreat! 7 Beds. AWESOME view! Property 26: Gorgeous Getaway in a Spacious Lake Retreat! 7 Beds. AWESOME view! 2 Suite Lands' End Condo - Right by the Outlet Mall! - Close to the Pool! Wi-Fi! Property 30: 2 Suite Lands' End Condo - Right by the Outlet Mall! - Close to the Pool! Wi-Fi! Ledges Walk-In Level w/ Main Channel View! Docks, Pool, Beach, Wi-Fi, Sleeps 8! Property 32: Ledges Walk-In Level w/ Main Channel View! Docks, Pool, Beach, Wi-Fi, Sleeps 8! WaterFront Condo! *NEWLY REMODELED* Ledges Unit! Property 34: WaterFront Condo! *NEWLY REMODELED* Ledges Unit! 3 Bedroom, 3 Bath, sleeps 8 comfortably. Top floor condo, main channel view! Property 36: 3 Bedroom, 3 Bath, sleeps 8 comfortably. Top floor condo, main channel view! Property 38: Beautiful Condo, Main Channel View! Sleeps 10! Two Lakeside Bedrooms/Decks! Property 46: Premium 2 BR Ledges (1032) Condo with an Awesome View!! 2 Kings, 2 Queens, Ledges Point Loft Condo! Million Dollar View & Free Wi-Fi! Property 47: 2 Kings, 2 Queens, Ledges Point Loft Condo! Million Dollar View & Free Wi-Fi! Property 48: Must See Ledges Lakefront Loft Condo, 4 Queen Beds, Beach, Pools, Wi-Fi, Docks! This was our first time booking a vacation on VRBO and we will definitely be back thanks to the great experience we had. We were able to get in touch with both Tiffani and Garrett during our stay. They were kind, helpful, and truly wanted us to enjoy our stay. The condo is perfect for kids and families. We especially liked to view from the upstairs master, books/games, and nearby beach! If you have small kids just book this condo you will be so happy you did. Thanks for a wonderful weekend. This condo had everything we needed. It was the perfect size for our girls&rsquo; weekend. Loved spending our days/nights on the deck, with a beautiful view.